Watch Arkells' Sparkling Cover of St. Vincent's "New York"
"We had a flat tire on the highway and figured that song out on the side of the road last night." Canadian quintet Arkells visited the Paste Studio on Tuesday to play three fresh arrangements of songs both new and old—although in this case, “old” means from 2016, and “new” means hot off the presses. “There’s a new song that just came out a couple weeks ago by one of our favorite artists, St. Vincent. It’s called ‘New York,’ and since we’re in New York, we thought we should play this song,” said singer-guitarist Max Kerman. St. Vincent’s “New York”—which came out June 30 as the first single from a yet-to-be-announced new album—marks the rare piano ballad by Annie Clark, anchored to a story of lost love and loyalty in the Big Apple. (“New York isn’t New York without you, love.”) Arkells added acoustic guitars, electric keys and a singalong chorus, rendering it a torch song in the grandest tradition. Said Kerman as the song faded out, “We had a flat tire on the highway and figured that song out on the side of the road last night.” Could have fooled us. 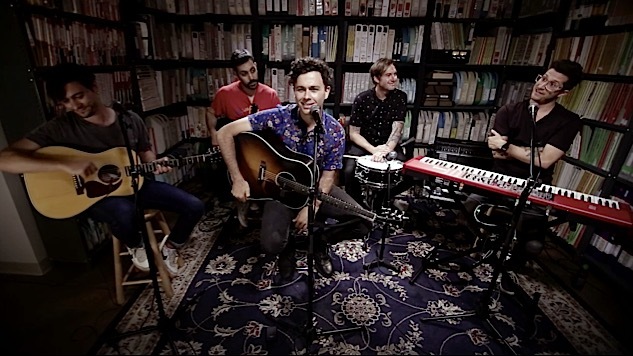 And make sure to check out Arkells’ full Paste Session, which also included a lovely version of “My Heart’s Always Yours,” from their 2016 release, Morning Report.